Paulownia (Paulownia tomentosa): growing, planting, caring. The paulownia is a larger-than-life pioneer tree: it grows fast, it blooms enormously, and spreads seeds everywhere. 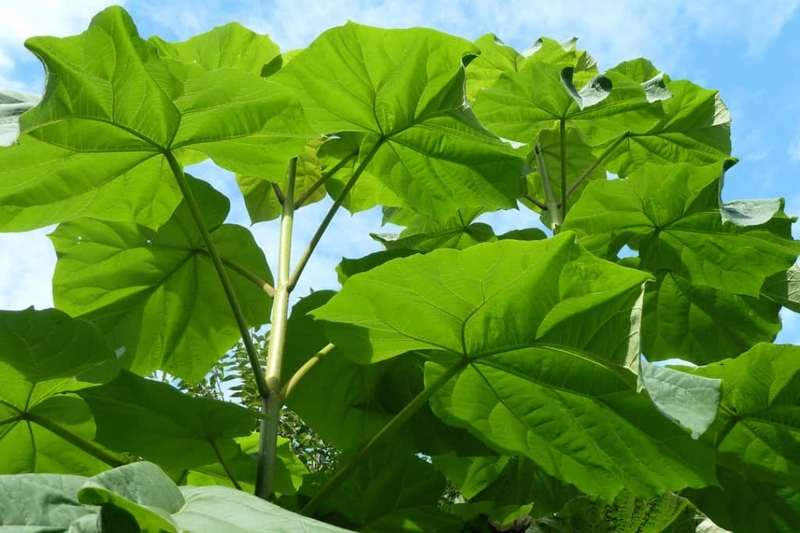 Paulownia tomentosa grows 10–25 m (33–82 ft) tall, with large heart-shaped to five-lobed leaves arranged in opposite pairs on the stem - the leaves can be mistaken for those of the catalpa. Paulownia tomentosa is tolerant of pollution and it is not fussy about soil type : for this reason it functions ecologically as a pioneer plant. Its nitrogen-rich leaves provide good fodder and its roots prevent soil erosion. Eventually, Paulownia is succeeded by taller trees that shade it. It cannot thrive in the shade of other trees. It is able to grow from small cracks in pavements and walls. Plant your paulownia in draining soil, rather humiferous even limestone or stony, in full sun. Plant preferably in winter, in bare roots or in mound. Dig a hole deep enough, twice as large as the root ball, without mixing the layers of the soil. Plant a solid stake at the bottom of the hole, on the edge, inclined to the prevailing winds. Cut the root hair - the fine roots that looks like hair - to balance the volume of roots and foliage. Plant without burying the boundary between trunk and roots of the tree, putting the soil layers in the same order you removed them. Tamp the soil around the roots with your foot, so you do not leave a pocket of air, and attach the stake to the trunk with a suitable extensible link. Form a hollow in the soil and water abundantly until you fill it. Water regularly and copiously for a few weeks after planting if you did it late. After, you should not have to care anymore, except during droughts. The paulownias withstands pruning pretty well, you can trim them each spring right above ground to keep them small and dense with very large leaves. For a tree habit, we advise not to keep side branches at the bottom of the trunk during the first years. Otherwise, a few years later, they will suffer from the shadow of the upper branches. Once it is adult, remove or prune the dry branches before they fall, every two years.